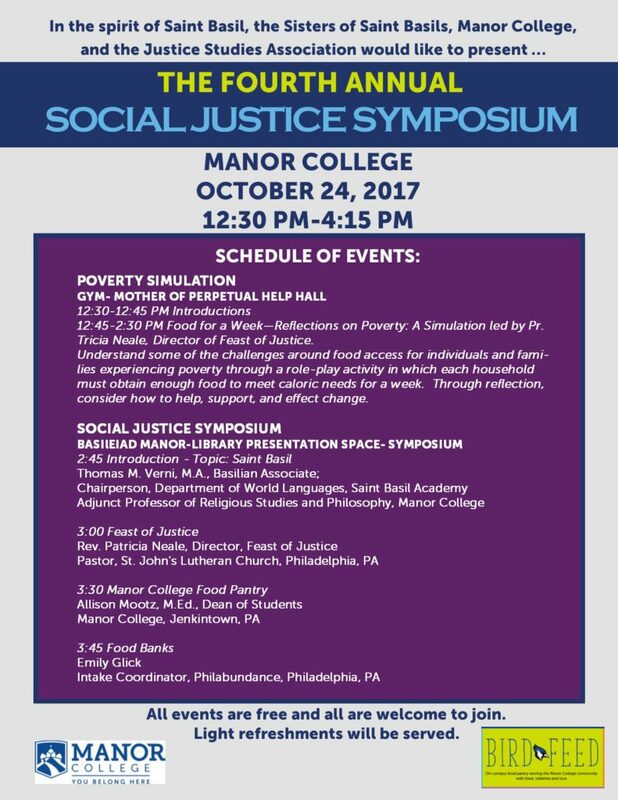 On October 24, 2017 Manor College will host it’s third annual Social Justice Symposium on campus from 12:30 – 4:15 PM. The event is being hosted by the Sisters of Saint Basil, Manor College and the Justice Studies Association, a student academic club on Manor’s campus. This is an annual event that the college holds, in the spirit of Saint Basil the Great who dedicated his life to helping the poor, hungry, and homeless. Included in the list of presenters is Thomas M. Verni, M.A., Basilian Associate; Rev. Patricia Neale, Director, Feast of Justice; Allison Mootz, M.Ed., Dean of Students at Manor College and Thomas Sims, Chief Development Office of the Food Bank of South Jersey. The event will start with a Poverty Simulation in the gymnasium located in the Mother of Perpetual Help Hall on October 24th at 12:30pm. The simulation will help show some of the challenges around food access for individuals and families who experience food poverty through a role-playing activity. Manor College strives to stay abreast with social justice topics and recently opened up a Food Pantry, Bird Feed as a response to the common issue that many college students face each day- not having access to food. This year’s symposium will be the fourth event of its kind at Manor College. The event has been a success in previous years and the college anticipates the same outcome for this year.